Home / Opinion / Mocha on Catholic Priests: "They should stop their false teachings and start re-learning God’s lessons." Mocha on Catholic Priests: "They should stop their false teachings and start re-learning God’s lessons." Esther Margaux "Mocha" Justiniano Uson, or simply known as Mocha Uson, a staunch supporter of President Duterte and currently the Presidential Communications Operations Office (PCOO) Assistant Secretary, shared her thoughts and opinion regarding the contentious remarks from Catholic priests against President Rodrigo Duterte. In her column entitled Hotspot on one of the top news media outfits in the country, Asec. Mocha then shared her disappointments and letdown to two Catholic priests. First is the one who was caught on a video praying for President Duterte to get sick and the other one is Fr. Robert Reyes who allegedly encouraged the military to decry the present administration. Asec. 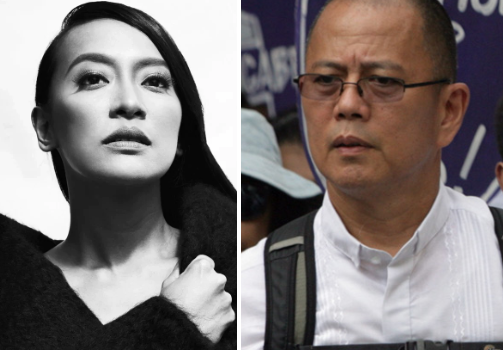 Mocha then conveyed and made it clear that she too admires their passion, however, she also believes that the priests are allegedly on the wrong side of the record and have gone past their pledge to God and the Christian faith. She likewise pronounced that Fr. Reyes is not doing the people, specifically the followers of the Catholic faith, any good, in light of the fact that instead of driving the people to pray for the improvement of the country, he calls for them to oppose the present government, hence, pushing the public to rebel and assault the administration. The PCOO Assistant Secretary further lectured the catholic priests with bible verses of God's words and teachings and reminded Fr. Reyes in particular, that he should have thought of these teachings before heaving cruel words against the president. Asec. Mocha also gave her compelling message to Fr. Reyes and said that she hopes that the latter can ponder his thoughts and obtain a better, more edified point of view on the most proficient method to manage the country's problems. That instead of spreading messages of hate and anger, he ought to support love and peace, particularly to those he considers to be his adversaries. "It really pains me to see Fr. Robert Reyes say such things, or even think about such things. I do hope that he is able to reflect on his thoughts and acquire a better, more enlightened perspective on how to deal with our nation’s problems. He should not nurture sermons of hate and anger, but of love and peace – especially to those he deems to be his enemies. ", she wrote. She then ended her article by sharing verses of the greatest commandments and asked, if the actions of the two priests that prays for the president to be ill and urges the soldiers to fail the administration, ways for practicing these commandments? She of course answered no and said that Fr. Robert Reyes and the other priest should stop their false teachings and start re-learning God’s lessons before it’s too late. "The answer is no. Hence Fr. Robert Reyes, and as well as the priest who prayed for the president to fall ill, should stop their false teachings and start re-learning God’s lessons before it’s too late." she said. 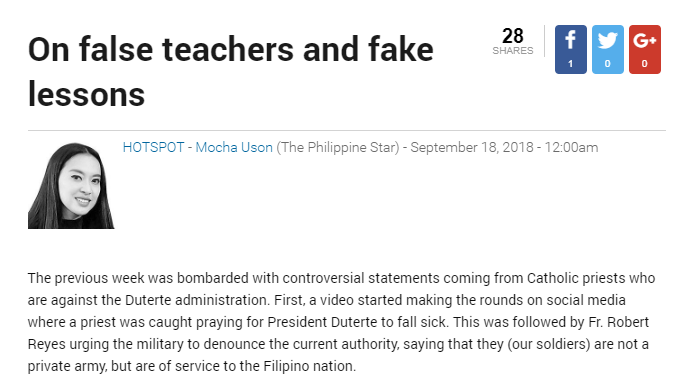 "On false teachers and fake lessons"
"The previous week was bombarded with controversial statements coming from Catholic priests who are against the Duterte administration. First, a video started making the rounds on social media where a priest was caught praying for President Duterte to fall sick. This was followed by Fr. Robert Reyes urging the military to denounce the current authority, saying that they (our soldiers) are not a private army, but are of service to the Filipino nation. While I admire their passion, I strongly believe that they are on the wrong side of history. And as priests, they have gone beyond their commitment to God and the Christian faith. First, Fr. 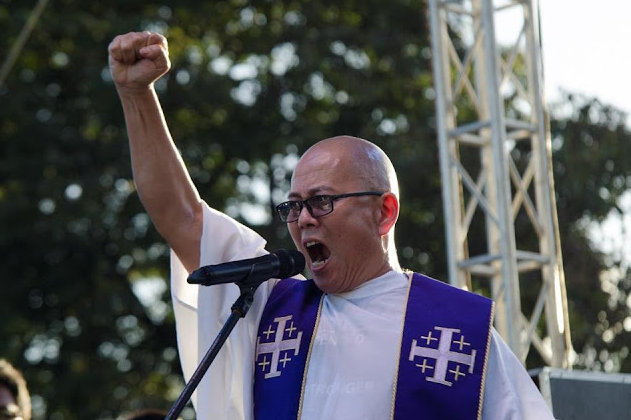 Robert Reyes is not doing the public and in particular the followers of the Catholic faith any good because rather than urge the people to pray for the betterment of our nation, he calls for them to rebel against the current government. Fr. Robert Reyes should have thought of this before spewing harsh words against the Duterte administration, because with his actions it shows that he doesn’t know how to respect authority. Second, as a man of faith, Fr. Robert Reyes should be leading the public in praying for the well being of our nation. He should be urging us to reflect on what is happening to our country and for us to discern as to which direction we should steer our country, and not dictate what to do. Because with what he is doing right now, Fr. Robert Reyes is not asking us to think and discern, but is rather pushing us to rebel and attack the government. He could have urged us to pray for the president and that he improves his decisions, as it is apparent that the priest is not happy with how President Duterte is handling the affairs of the country. But no, he is urging us to revolt. This is very alarming because as a priest, he is also a primary influencer in society. He feeds the people with his agenda each and every time he celebrates mass. And with his statements, he is nurturing his followers with hate and anger. Are these the kind of emotions that we would want to carry in our hearts? Third, as a priest, Fr. Robert Reyes should take the lead in abiding the law. He should be the first to respect the law and only rebel when the government forbids him to practice his faith. But the government is not doing that, so there is no point to go against it. Fr. Robert Reyes claims that President Duterte is a dictator, especially now that it is under his administration that the amnesty of Sen. Trillanes is revoked and is now pending arrest. Had he been indeed a dictator, the president would have had the senator apprehended immediately. But now, he is still waiting for the court to decide before the actual arrest can take place, but he believes in due process. Where is the dictatorship in this scenario? It really pains me to see Fr. Robert Reyes say such things, or even think about such things. I do hope that he is able to reflect on his thoughts and acquire a better, more enlightened perspective on how to deal with our nation’s problems. He should not nurture sermons of hate and anger, but of love and peace – especially to those he deems to be his enemies. In Mark 12:30-31, the greatest commandment is to “Love the Lord your God with all your heart and with all your soul and with all your mind and with all your strength.” And the second greatest command is to “love your neighbor as you love yourself.” Is praying for the president to fall ill, or urging our soldiers to turn their backs on the administration ways of exercising these commandments? The answer is no. Hence Fr. Robert Reyes, and as well as the priest who prayed for the president to fall ill, should stop their false teachings and start re-learning God’s lessons before it’s too late."